I have a 05 C50 with a bad fuel pump. I bought a used one but it has 4 prongs. Can one wire get cut out? And what is the spike thing on the side of the pump. Is that for the low fuel sensor? Not knowing exactly what you did get, probably nobody can give you a good answer. You really NEED to get the right one for that model. If possible, get your money back for the wrong one. Post a pic of both pumps, the wiring connector of the new pump and your bikes connector and someone may be able to help. What I see appears to be an in tank fuel pump, not different from cars. 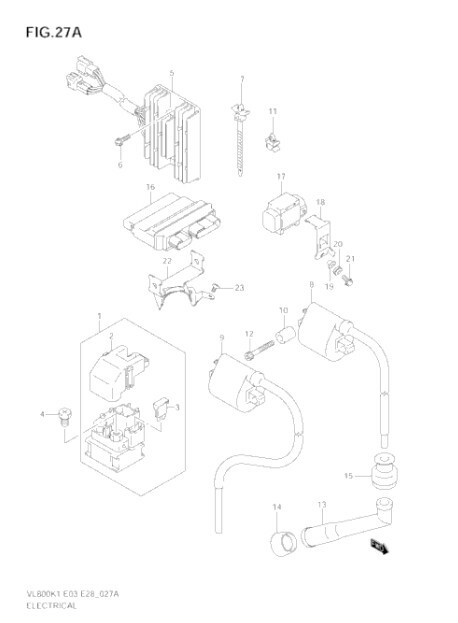 To replace the in-tank fuel pump unit, it only comes with the entire assembly as Item No. 1, PUMP ASSY, FUEL 15100-41F10. You can look at the price for sticker shock, but it is what it is, dealer parts will cost more. Case in point, replaced pump assembly on my S10 truck 10 years ago, in less than a year, McMasters pump failed, I bought a Chinese rebuilt and installed in the McMasters pump housing, ran fine for a couple months, then truck ran weak at above 35 mph speeds without power. Took it to the dealer. Mechanic diagnosed right away, bad pump. Told me on this model only OEM pump works. Pump was roughly $500, labor $100. McMasters pump was under $200. Chinese pump unit only was $65. Lesson? Some models of vehicles, only OEM pump works. This goes my 1992 Dodge Caravan (replaced pump 4 times, got to where I could drop the tank in less than 45 minutes!) and 1999 S10. 1990 Dodge D150 truck, replaced the fuel pump unit every 100,000 miles twice, got rid of the truck with 245k miles still running well. Seems very few parts houses do the fuel pumps well enough to replace OEM. Fuel injection systems operate at high pressure and require a fuel pump tailored to the specific make and model, pressures vary, what is right for one bike is not necessarily right for the other bike. So, unless you really know what you are doing, I'd stick with a pump specifically made for your bike. 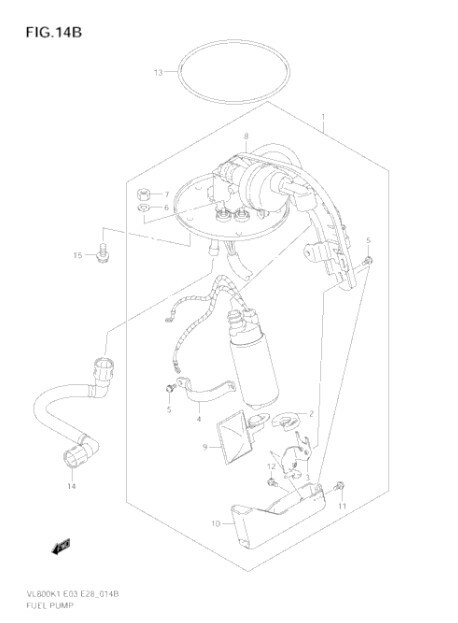 Now that I am off my soapbox , your pump according to Ayers diagram appears to be an in tank unit, costs about the same as an OEM car unit. It has 2 wires to it. There is a companion relay unit called Item# 17, SENSOR ASSY, FUEL CUT 33960-06G10, that has 4 wires. It resides outside the tank. It controls when the fuel pump turns on and off. I couldn't find a late enough model C50 wiring diagram, so I looked at a VL1400 diagram. It too has a 2 wire fuel pump with a 4 wire sensor unit. That 4 wire pump you got in mind won't work. It may be the lower pressure one (i.e., 2 to 7 lbs. pressure) for a carburetted bike (although would need more facts to go on. Also, are you sure it is the pump and not something else like the sensor unit or else? Last edited by High Plains Thumper; 08-06-2018 at 07:30 PM. if you can drive a stick can you ride a bike?